Fast delivery, reliable, packaged well! Great toner at an affordable price! This toner really helped to clear out my blackheads around my nose & whiteheads around my chin & cheek areas. I was really impressed as i didnt expect a toner to do that well... pls make sure to apply a sunscreen if ur applying it in morning as well It makes my skin soft & prep for rest of my products to apply. My skin type is oily & acne prone skin. I've been using it for a few weeks now so I don't think my results are conclusive. 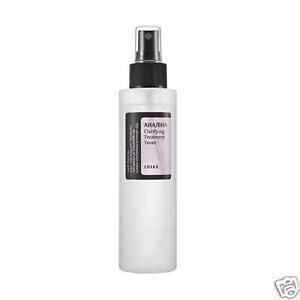 Its an okay toner, I like to use it as a face spray, right after cleansing and/or exfoliating. It does irritate the eyes but if you are careful enough by ceeping them tightly shut then your eyes don't get irritated. I like how it calms down my face after cleansing and or exfoliating. It kind of does look brighter. Remember not to use it with vitamin C as they counteract. I use a vitamin c serum so I only use this toner during my morning routine. I recommend bying this one as I really like that you can use it as a spray, whilts not wasting any product on cotton pads. My skin was breaking out and scarring for two months due to stress. I started using this about a month now and noticed that my skin isn't breaking out crazy anymore and it is also clearing up. I have read reviews that this toner makes one's skin more sensitive to the sun, but my face feels okay for now with use of SPF50 PA+++ sunscreen. I certainly won't use this product religiously. Once I feel confident with my skin again, I'll switch to something else and only use this toner when my skin needs it. First impression you'll think like you're spraying water on your face but this is my 3rd bottle so it means I really like this toner. When there's a bump I feel like acting up then I spray it in a cotton and leave it on the spot until the cotton dries up. A little tip though is to give any product a pause so that way your skin don't get immune with it. So after my 3rd bottle I paused for like a month and then go back and use it again.